A collection of 59 pen-and-ink illustrations by world-renowned artist, conservationist, scientist and entrepreneur Dr. Guy Harvey is now on display along the grand staircase of the Key West Art & Historical Society’s Custom House Museum, 281 Front Street in Key West. The exhibit is on loan indefinitely by Dave and Cheryl Copham. 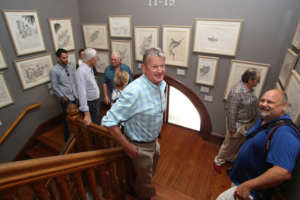 Titled “Depicting Hemingway: Guy Harvey Sketches The Old Man and the Sea,” the exhibit is based on the tale of Santiago the fisherman and his battle with the marlin in Ernest Hemingway’s Pulitzer Prize-winning novel. The Old Man and the Sea was introduced to Dr. Harvey by his mother when he was 11 years old and it instantly fascinated him, becoming his biggest inspiration to become an artist and begin depicting marine life. The 59 pieces were drawn by Dr. Harvey over the course of a year while attending boarding school England as a teenager. According to Dr. Harvey, the range of media he uses today was all developed from this illustrative pen and ink style. Guy Harvey is a unique blend of artist, scientist, diver, angler, conservationist and explorer, fiercely devoted to his family and his love of the sea. His childhood passion for the ocean and its living creatures not only inspired him to draw, but fueled a burning interest that prompted a formal education in marine science. Having graduated with honors in Marine Biology from Aberdeen University in Scotland in 1977, Guy returned home to Jamaica to resume his education, earning his Ph.D. from the University of the West Indies in 1984. Though he gave up a budding career as a marine biologist for that of a highly acclaimed artist, Guy has continued his relentless pursuit to unravel the mysteries of the sea, traveling the world to better understand the habits and habitats of the marine wildlife he paints. For more information, please visit www.guyharvey.com. Follow Guy on Facebook at www.facebook.com/DrGuyHarvey, on Twitter at www.twitter.com/DrGuyHarvey, connect on Instagram at www.instagram.com/drguyharvey, on Pinterest at www.pinterest.com/DrGuyHarvey, Snapchat @RealDrGuyHarvey, and tune in to see Guy’s latest expeditions on YouTube at www.youtube.com/user/DrGuyHarvey.